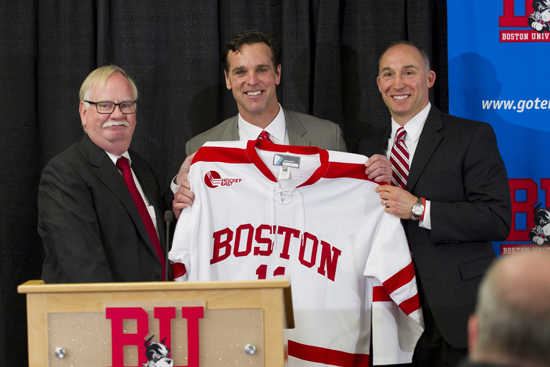 David Quinn (CAS '89), a former Terrier all-star player, captain and associate coach, was named the eleventh coach of the Boston University hockey program today. He succeeds his coach at BU, Jack Parker, who retired after four decades--and 897 wins--at the end of this season. "It's great to be home. I'm a BU guy through and through," Quinn said. "No question this is my dream job." I knew that I missed college hockey. It struck me about three weeks ago during a one week stretch, the Nashville Predators came into Colorado to play us and Colin Wilson is on that team and he was obviously on the 2009 team. He called me the night before and wanted to go to dinner, and at the pro level that's frowned upon, so I wasn't able to do that. Then, two nights later, the St. Louis Blues show up and Kevin Shattenkirk Is on that team and he wants to do the same thing the night before. I saw him at the pregame skate the next day. I was actually talking with Joe Sacco after that and you talk about how unique the college experience is and you don't get that at the professional level. Then, two days later, we go out to Anaheim and Nick Bonino is waiting for me as we get off the team bus. It struck me that it's something that you don't get at the pro level. ● College Hockey News press conference report, Quinn's "dream job"
● USCHO: BU "in great hands"
2014 recruit Jonathan MacLeod, a shutdown defenseman known for bone-jarring hits, is the subject of a USA Hockey profile . The Dracut, Mass. native, who spent his sophomore year on the Kimball Union Academy blueline with 2013 BU recruit Doyle Somerby, is a mainstay of the NTDP U17s' defense. When he arrives at Agganis way, he'll follow in the footsteps of defensemen Brian Strait, Colby Cohen and David Warsofsky as NTDP program grads mentored by David Quinn. Terriers, who lost to Minnesota in the NCAA title game, finished at #2 in the final national polls. Two skaters earned Hockey East recognition for their Frozen Four efforts. Co-captain Marie-Philip Poulin was named player-of-the-week, while Sarah Lefort earned rookie-of-the-week honors for an incredible eighth time, including each of the past three weeks. BU was the WHEA team of the week.